We have the solution for your problem! During AC power on there is a very high inrush current flowing into the LED powersupply due to the charging of the input filter capacitors. The inrush current can be as high as 70-80A for each LED powersupply. Because of this there is a big risk that the circuit breaker will trip if/when connecting several LED powersupplies to the same circuit breaker. Our inrush current limiters will solve this problem. 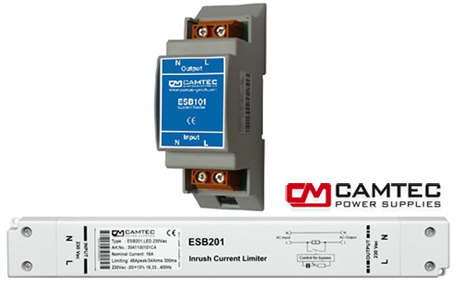 Install our inrush current limiter together with our LED powersupplies and the circuit breaker will not trip no matter of which characteristic they have. Easy connection in between the circuit breaker and the powersupplies. The only parameter the installer must take into consideration is that the total combined primary currents (nominal current) from all the powersupplies together do not exceed 16A. See our datasheets for further information och contact us.